This animation was started in the winter of 1997 and finished in spring of 98. 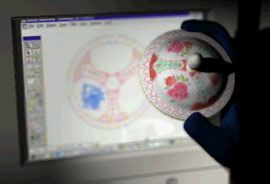 The patterns painted on the jar were generated individually and then mapped to the object three dimensionally. The image was rendered without post-production editing. 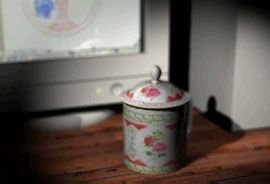 The animation also features animated depth of field and an animated computer screen which shows how the color maps for the 3D objects were created. The maps began in Illustrator by creating custom seamless patterns and combining them with other patterns. Then the shapes were colored with Metacreations Painter and composited in Photoshop.